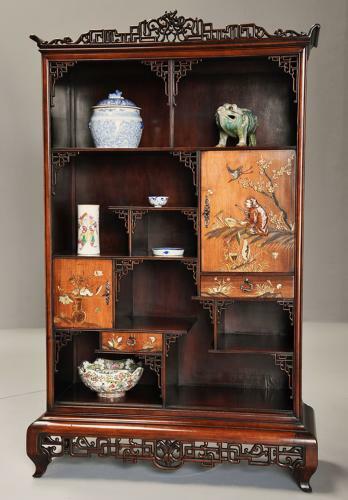 This display cabinet consists of a superbly carved open fret pediment to the top with carved dragon to the centre leading down to an arrangement of asymmetrical shelves, cupboards and drawers, each of the open shelves having a superbly carved open fret bracket to each of the top corners, the cabinet is supported by a carved open fret base with central carved lotus flower and terminating on shaped legs. The cupboard door and drawer fronts are decorated with superbly fine quality inlaid mother of pearl and ivory and applied gold and colour lacquer work and retain original silvered decorative handles & escutcheons with original keys. The larger door depicting a landscape with a seated musician in traditional costume playing a kettle drum, a cherry blossom tree next to him with a stork (or possibly a crane) in flight, lotus flowers and leaves and butterflies. The smaller door decorated with a painted vase with wonderful display of flowers including lotus flowers and insects in a landscape setting, the drawers having flowers and butterfly decoration. Many of the flora and fauna depicted have symbolic meanings such as the lotus flower: a symbol of purity and devotion, the butterfly: a symbol of springtime and marital bliss, the stork: a symbol of rebirth and creation, the crane: a symbol of happiness and eternal good fortune. This cabinet is in excellent condition for age with no missing pieces, is of stable construction and can go straight into a home or collection. Please note: the items displayed on the cabinet are not included.